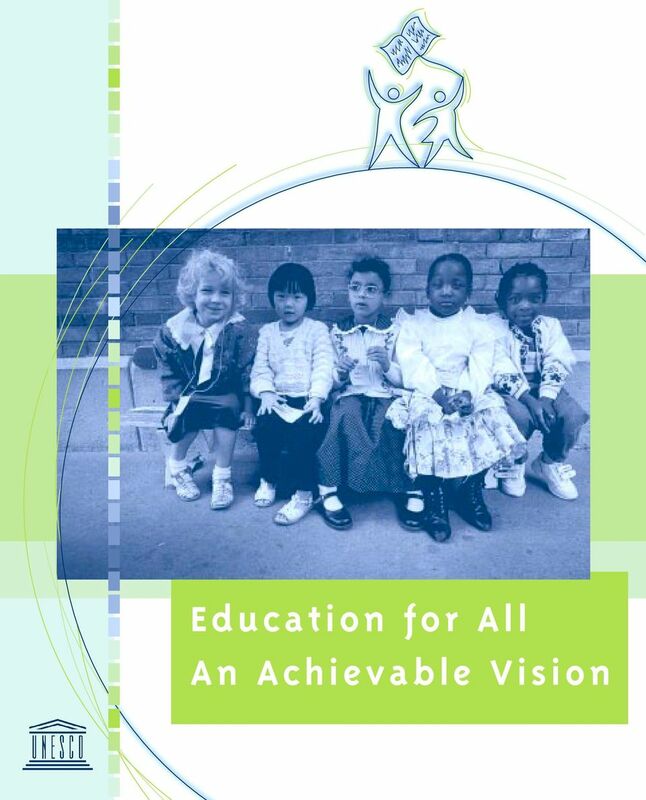 Download "Education for All An Achievable Vision"
3 The Challenges At the dawn of the new century 875 million of the world s citizens are illiterate. One out of every five children aged 6-11 in developing countries an estimated 113 million is not in school, 60 per cent of them are girls. Nine countries Bangladesh, Brazil, China, Egypt, India, Indonesia, Mexico, Nigeria and Pakistan (E9) are home to 70 per cent of the world s illiterates. Girls and women are most at risk. In South Asia an estimated 60 per cent of women are illiterate. Worldwide, one woman in four cannot read. In South Asia and sub-saharan Africa, less than three out of four pupils reach Grade 5. The HIV/AIDS pandemic threatens to wipe out much of the progress made in boosting literacy and general education levels. Up to 10 per cent of teachers are expected to die in the worst-affected African countries. Some Advances The World Conference on Education for All (Jomtien, Thailand, 1990) placed basic education high on the development agenda. Since then real progress has been made: 10 million more children attend school each year and adult literacy rates rose to 85 per cent for men and 74 per cent for women. Strong political commitment can make the dream of Education for All (EFA) a reality. Many countries not only in the richest parts of the world but also in Latin America, the Caribbean, East Asia and even in Africa are now approaching universal primary education for the first time. Countries such as Botswana, Brazil, China, Mexico, Sri Lanka and Tunisia are showing the way. 4 The Commitment Renewed In April 2000, more than 1,100 delegates from 164 countries reaffirmed their commitment to EFA at the World Education Forum in Dakar, Senegal. They adopted the Dakar Framework for Action a bold, practical document laying out goals and strategies for achieving Education for All. The six Dakar goals: z1 Expand early childhood care and education. 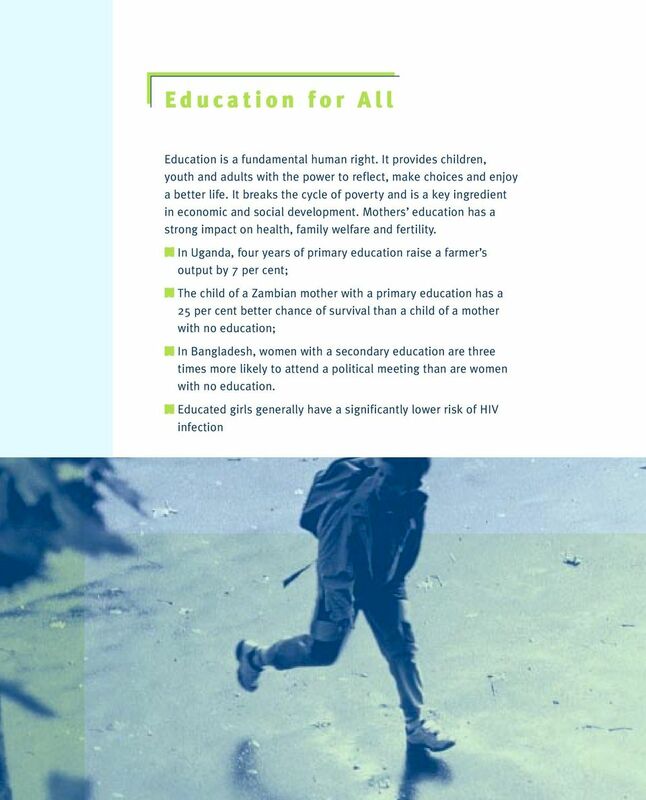 z2 Free and compulsory education of good quality by z3 Promote the acquisition of life-skills by adolescents and youth. z4 Expand adult literacy by 50 per cent by z5 Eliminate gender disparities by 2005 and achieve gender equality in education by z6 Enhance educational quality. Three Milestones The Dakar Framework for Action sets three major deadlines: 2002: FINALIZING NATIONAL ACTION PLANS By this date all states are requested to develop or strengthen national plans of action with concrete strategies for achieving the Dakar goals. These plans must be part of existing anti-poverty strategies and be prepared in consultation with all groups in society including community leaders, teachers, parents and learners. 2005: ENSURING EQUALITY FOR BOYS AND GIRLS The aim it to achieve equality for boys and girls in access to both primary and secondary education by this date. 2015: ACHIEVING EDUCATION FOR ALL This is the deadline for the realization of universal primary education and a 50 per cent improvement in levels of adult literacy. 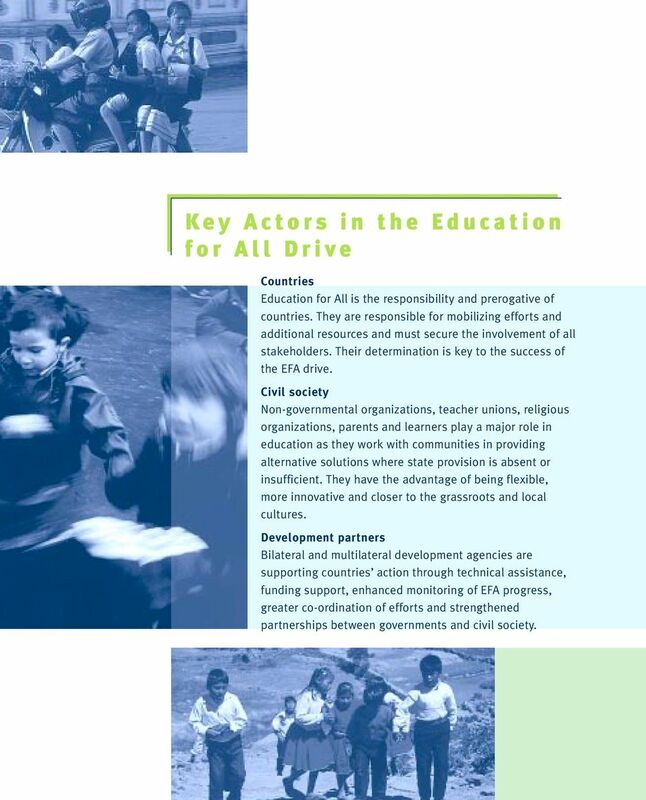 5 Key Actors in the Education for All Drive Countries Education for All is the responsibility and prerogative of countries. They are responsible for mobilizing efforts and additional resources and must secure the involvement of all stakeholders. Their determination is key to the success of the EFA drive. Civil society Non-governmental organizations, teacher unions, religious organizations, parents and learners play a major role in education as they work with communities in providing alternative solutions where state provision is absent or insufficient. They have the advantage of being flexible, more innovative and closer to the grassroots and local cultures. Development partners Bilateral and multilateral development agencies are supporting countries action through technical assistance, funding support, enhanced monitoring of EFA progress, greater co-ordination of efforts and strengthened partnerships between governments and civil society. 6 UNESCO s Tasks UNESCO was mandated by the World Education Forum to co-ordinate the global efforts to achieve Education for All by Its key tasks are to: z facilitate the development of EFA partnerships, in particular between governments and civil society organizations; z ensure that the activities of all EFA partners are compatible with one another and consistent with the EFA agenda. UNESCO s Director-General convenes annually a high-level, small and flexible group to sustain political momentum and mobilize resources for basic education. UNESCO also brings together an EFA working group of experts to receive technical guidance, build and sustain partnerships and support regional and sub-regional networks. An EFA Observatory has been set up within the UNESCO Institute for Statistics to monitor progress towards EFA. New indicators are being developed and countries receive assistance in collecting educational statistics. 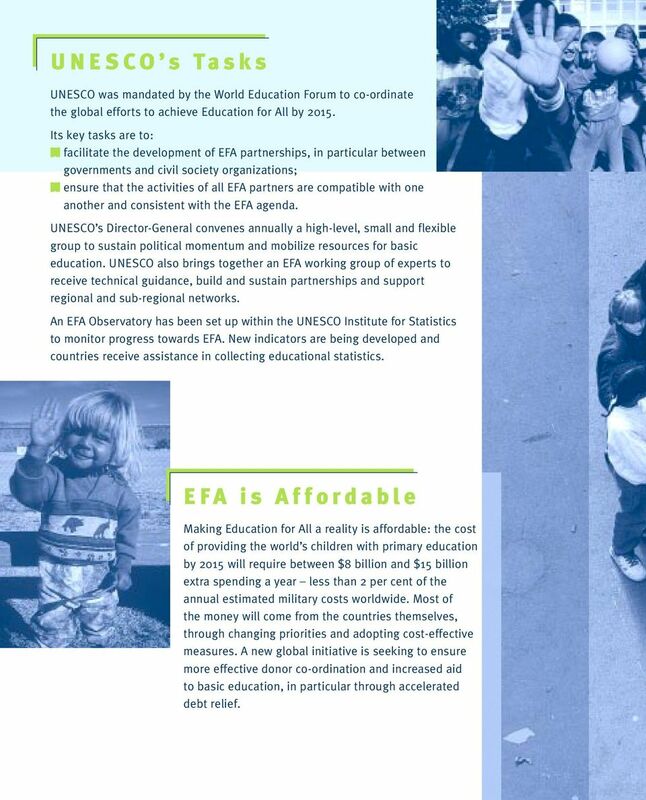 EFA is Affordable Making Education for All a reality is affordable: the cost of providing the world s children with primary education by 2015 will require between $8 billion and $15 billion extra spending a year less than 2 per cent of the annual estimated military costs worldwide. Most of the money will come from the countries themselves, through changing priorities and adopting cost-effective measures. A new global initiative is seeking to ensure more effective donor co-ordination and increased aid to basic education, in particular through accelerated debt relief. 7 EFA is Achievable Universal primary education This goal will remain a distant dream unless a major effort is undertaken to accelerate the current trends. Primary schools in developing countries will need to accommodate about 156 million more children than in 1997, an increase of 27 per cent. At a minimum, this will require maintaining the previous enrolment effort. z A particular effort will be needed in sub-saharan Africa, which will have to find 88 million additional school places. Particularly large increases of more than 10 times the previous effort are needed in Angola, the Central African Republic, the Democratic Republic of Congo, Lesotho, Liberia, Niger and Somalia. z South Asia will have to enrol about 40 million more children an increase of one third requiring at least the same pace of effort as in the 1990s. z The Arab States need twice the previous effort to accommodate some 23 million additional children, representing an increase of 72 per cent. Adult literacy To expand adult literacy by 50 per cent, the number of adult literates will have to increase annually by 92 million. This implies speeding up previous efforts by 1.3 times. Africa and South Asia face substantial challenges, in particular in the least developed countries, where success will require more than a doubling of past efforts. Some regions of the world, notably East Asia, the Pacific, Latin America and the Caribbean will reach the goal by maintaining nearly the same level of effort as in the past decade. 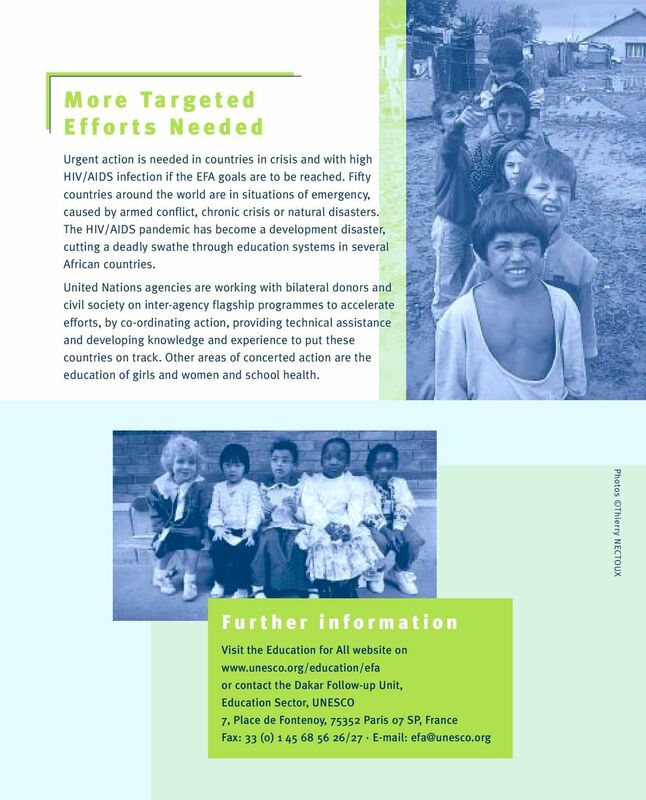 Millennium Development Goal 2 Global Education Scorecard: Who s on target? Kigali Statement. Sub-Saharan Africa Regional Ministerial Conference on Education Post-2015. Kigali, Rwanda 9-11 February 2015. 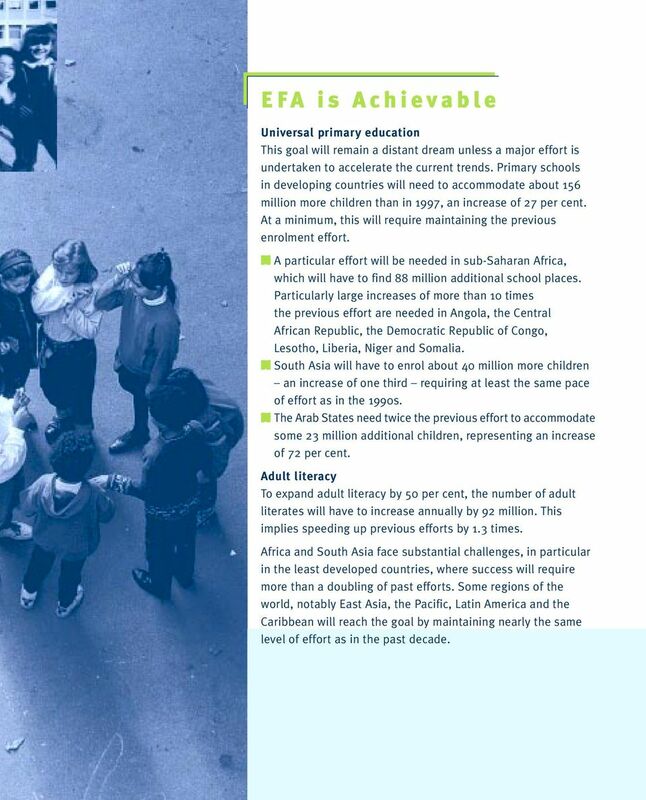 EFA Global Monitoring Report. Education for All. Summary Report. Education for All IS THE WORLD ON TRACK? GCE is built on the conviction that quality education for all is achievable, and by the concern for immense cost of failure.